Perhaps the biggest change you can make to your images of people is getting to know them or see their world a little more the way they do. 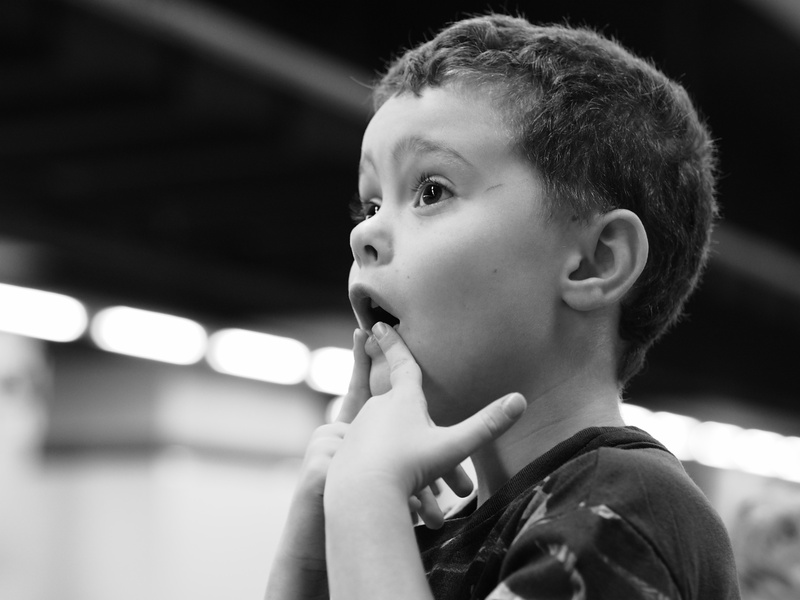 When photographing children taking pictures at their eye level is highly beneficial. This picture has a totally different feel thanks to applying this approach. Having a camera with a flip out screen can help with that a lot. I often find this way of shooting far more discreet as well allowing moments which would end the minute the subject noticed I was raising a camera to my eye. Sometimes we over complicate things. 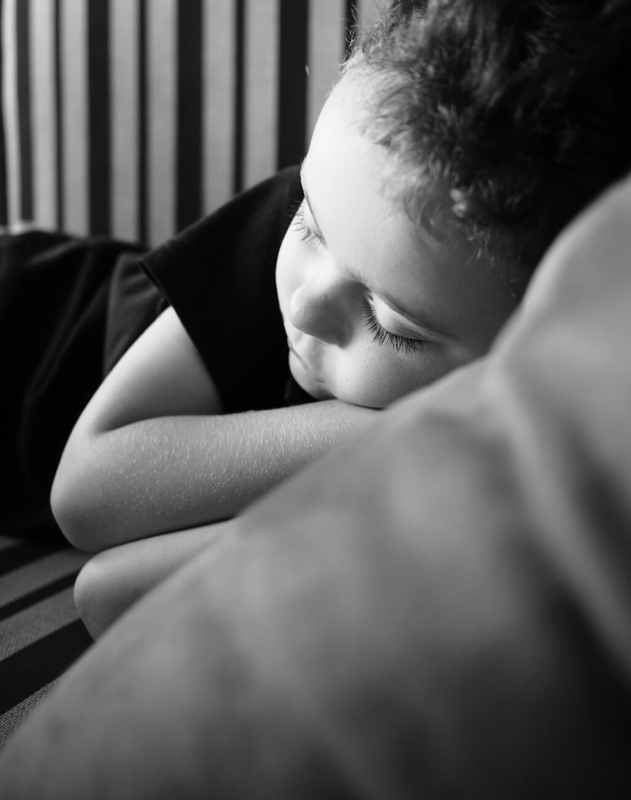 I think that is why I have been moving back to simply shooting black and white. I took this image in both colour and in black and white. At the time I really thought that the red and cream stripes of the couch would contrast nicely with the dark navy golf shirt that makes up the school uniform but in the end I was wrong. Well, that is my view at least. Perhaps one of the most important lessons to learn early on in your photography is to pay attention to the background. Often in a moment of great excitement we snap an image only to look at it later and see light pile protruding out of someone’s head. On occasion the result can be humorous but that is the exception and not the rule. I would venture to say that after you have mastered colour and exposure of an image to match what you see, the next biggest contributor to a moment not appearing in the still image in the same way you experienced, it is the lack of attention background when taking the image. Sometimes though, the decisive moment happens in the background. That was the situation in this image at least. 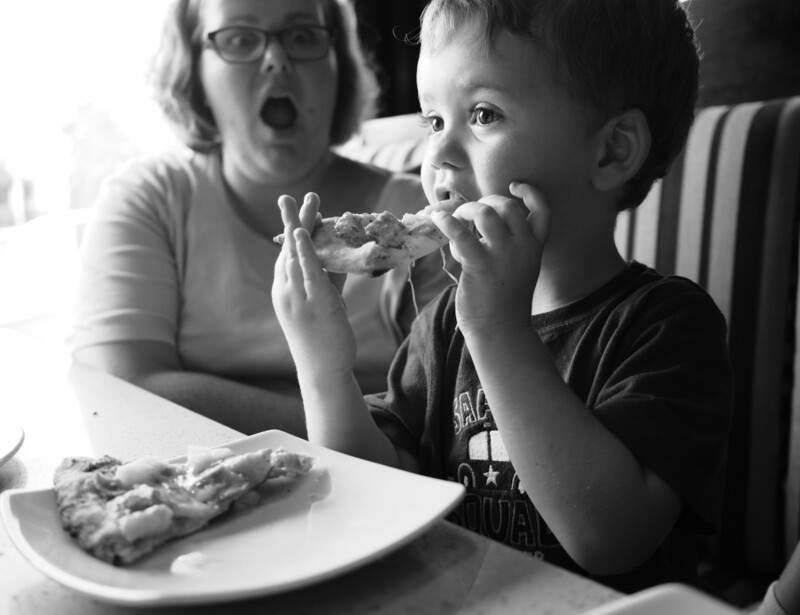 While I was trying to capture the boy enjoying his pizza, I did not notice at the time Mom’s reaction in the background. It made the image for me at least. There is a popular phrase about the journey of a thousand miles beginning with a single step and so today, I am taking that step. It may not be an entirely new journey, it is more like a return to the very start. In 2007 I composed my first blog post on the original PhotoComment site. The idea back then of PhotoComment was a home for my personal thoughts on the photographic industry and just about anything else that revolved around my passion for pictures and camera gear. Over time things grew and splintered, the next thing it was a magazine and then one day it was all gone. I lost my love for the industry, the gear, the art… it was all numb. After a break, I have recently picked up a camera again. I am shooting for the love of it now. With this in mind, I have decided to go back to the core of why I registered the domain, www.photocomment.co.za to begin with. Thanks to Greg for helping set things up. Those of you looking for the original content that spanned the years on the original PhotoComment site, you can still do so. Head on over to www.archive.photocomment.co.za and find the old site there. Over time some links may have broken, so I cannot guarantee everything works like it did back in the day, but some may still find it useful. So moving forward, I cannot tell you exactly yet what to expect on this site. Some of my images sure… maybe the odd chat with a photographer friend. The idea about the name ¨PhotoComment¨ was for it to be a place where I could comment on the photographic industry, but also from time to time, a place where photographs could make their comments on the world we live in.